I have this recurring dream. The world has gone dystopian. Well, more dystopian. And there is a ruling that there will be no more cookbooks or recipes. We must use only what we already have and nothing new is to be imagined or created. I wake up in a cold sweat. Then I relax and realize that authors and chefs and publishers will forever continue the stream of culinary treats for us to consider and ideally savor. All is well. Still, it raises the question: what if each of us had to live for the rest of our lives with the cookbooks from only one author. Just one. And now we have Everyday Dorie. These are the recipes Dorie cooks at home, for weeknights and weekends. For family, for herself. Dorie emphatically states that these are recipes that you, too, can readily make at home. Nothing is complicated. No certificate from the CIA is needed. But pleasure, true pleasure is guaranteed. 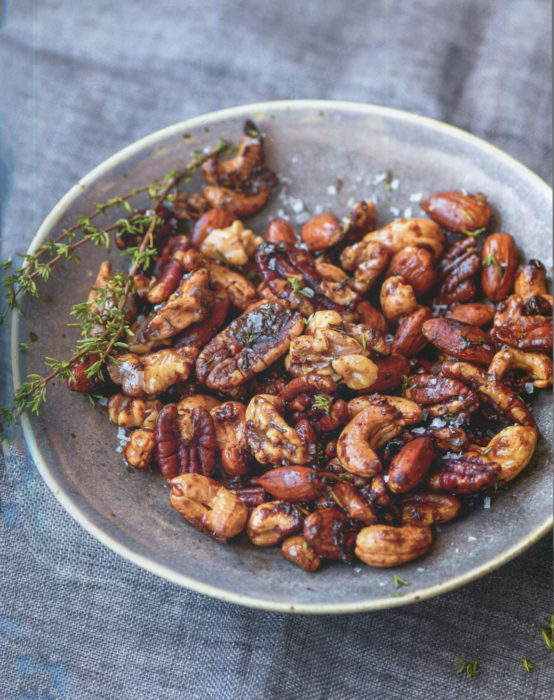 Those are her Candied Cocktail Nuts, created with Dorie’s signature style and technique. No egg whites here. The covering liquid is melted butter, syrup and brown sugar. The spice additions are carefully chosen and balanced. You’ll be eating nuts, not chunks of cinnamon. It’s a grand recipe and Suzi and I will be taking a batch to each holiday party this year. What better gift could you offer? That thyme on top is the perfect example of Dorie’s delicate additions that transform recipes from mere food to true treats. Most of the recipes are accompanied by a lovely photograph. The food photography in this book is supremely distinguished. It could not be better. The book is published on high gloss paper that lets the pictures pop. You can’t quite smell them, but you can try. 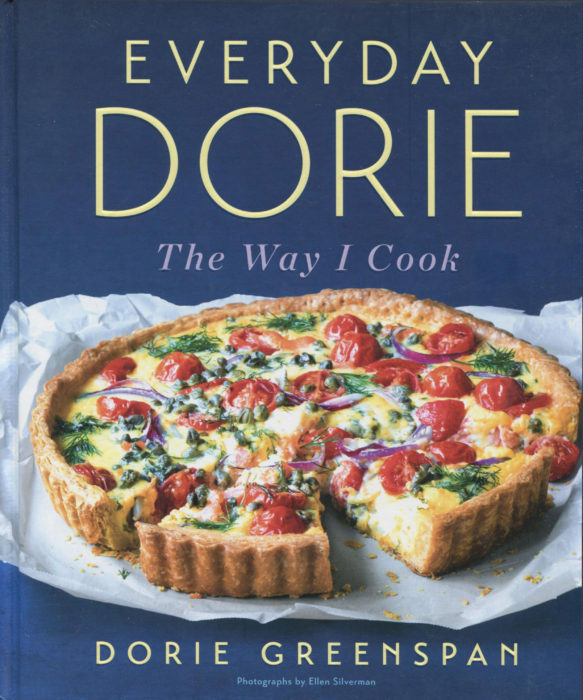 Now, each Dorie book seems to generate buzz about one special recipe [all are special, but some just capture the attention of the planet]. 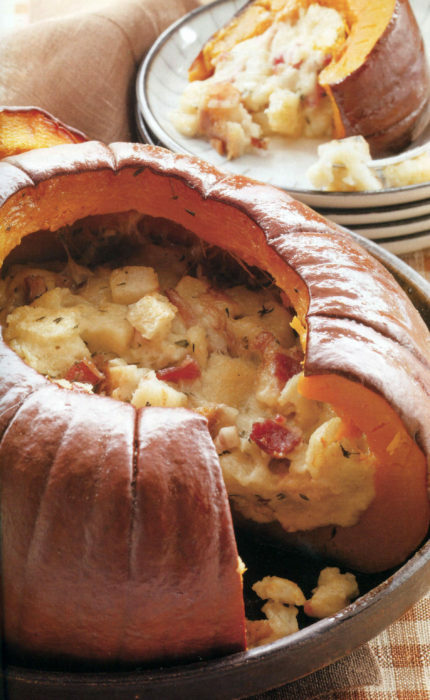 From Around My French Table, how many of us have tried the Pumpkin Stuffed with Everything Good. And then cooked it over and over. Remember? 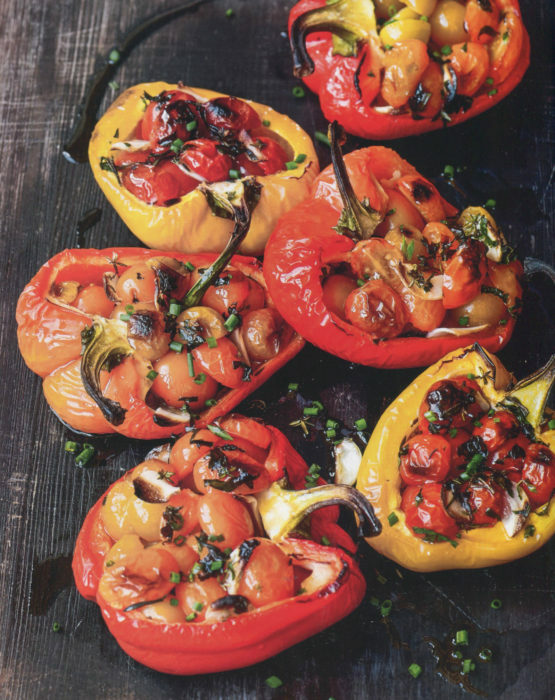 Well, in Everyday Dorie we have Oven-Charred Tomato-Stuffed Peppers. Yes, I’m posting this recipe later today. Yes, we are cooking it this weekend. Dorie claims this is just her everyday, family cooking. I want to be adopted into that lucky family. You’ll want this book for the holiday season. And for the rest of your life. Sublime perfection.